Offering magnificent views of the Aegean Sea and famous Elia Beach, this exquisite all-villa luxury resort combines minimalist elegance and high-end luxury in an alluring blend of cutting-edge art and design. Designed for those who seek ultimate privacy, total relaxation and five-star personalized services, these superb Mykonos villas feature magnificent interiors, state-of the art amenities and outstanding facilities. 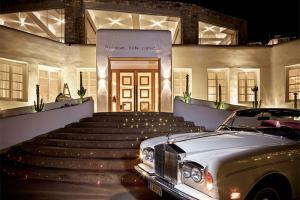 Located 6 miles from the Mykonos National Airport. Agios Sostis Beach, Archaeological site of Delos, Mykonos SeaBus, Little Venice.